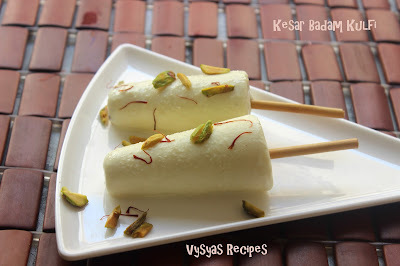 Kulfi is a Rich Creamy frozen Indian dessert has its origins from Mughal Empire. Traditionally thick milk is condensed to more than half of the quantity, then Powdered Badam,Pista Cashews are added then flavoured with saffron &Cardomom. 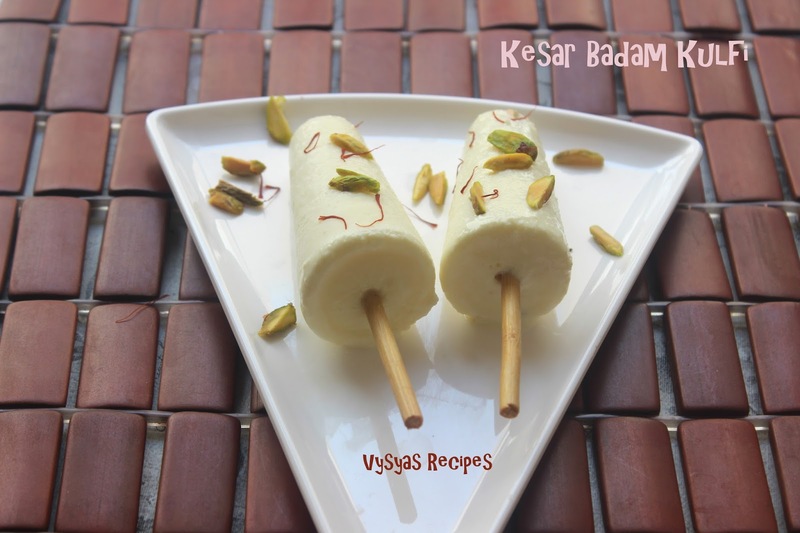 kulfi comes in number of varieties like mawa kulfi,kesar badam,kesar pista,rose. 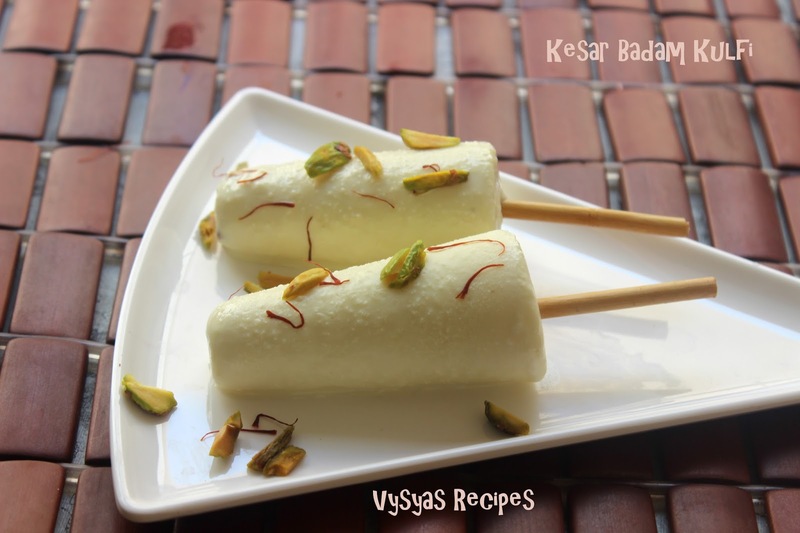 In some varieties fruit puree is added to basic kulfi.Apple,Mango,banana,pear & banana's are Pureed & added to basic kulfi Recipe to get Variations.In Barbeque Nation, Kulfi Counter they serve 5 different types of kulfi with various Topping. We had tried all the varieties.Now we will see the kulfi Preparation. Cook Time : 20 minutes. Saffron strads - 4 -5. Soak Badam in hot water for 15 - 20 minutes,then peel the skin of it. Soak Saffron in warm water for 20 minutes. Chop 4 -5 pistachios for Garnishing. Boil the Milk in a Pan & cook ,till it reduces to Half.Stir Now & then,then scrap the sides of pan to avoid creamy milk sticking to a Pan. Meanwhile Grind peeled Badam & 5 Pistachios into a fine Paste. When milk was reduced to half the quantity add Badam Paste,Sugar & Saffron Milk. Cook for 5 - 6 minutes.Then switch off the flame. Allow it to cool Completely. It thickens when it starts Cooling. When it cools down Completely Pour in Kulfi Mould & freeze for an hour. Then insert the sticks & freeze overnight. To demould the Kulfi run under tap water for few seconds.Gently Pull the stick to remove the Kulfi's. Serve with chopped nuts on the top. Instead of Kulfi Mould you can use small stainless steel cups or disposable cups. Instead of Grinding you can also finely chop the nuts. Always use full fat cream Milk for best Results. you can also pour the kulfi mixture in a vessel,freeze it & cut it.